Just a few hours before the 70th anniversary of Indian Independence (71st Independence Day) on 15th August, the multicultural broadcaster, SBS, has decided to use a distorted and incorrect Map of India in its site. 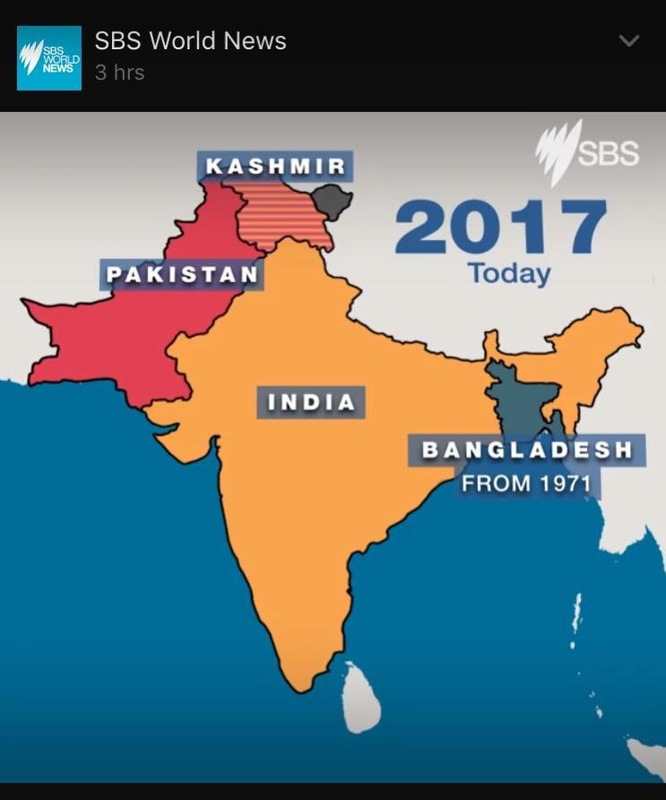 Kashmir is inalienable part of India, but SBS is showing it to be otherwise. The reason, whether it is due to poor information, mischief, unintentional mistake or due to intended purpose to insult India and Indian Australians (which I doubt), remains to be determined. Whether SBS took inputs from Executive Producers of various Indian language programmes is also not known. The best approach SBS, our own broadcaster, should do is to liaise with Consulate General of India in Sydney or High Commission of India in Canberra in regards to a matter like this. It is worth consulting DFAT too, because they are very aware of matters like this. A few years ago, we dealt with a similar matter involving Department of Immigration of Australia. We have lodged our protest with SBS authorities and shared the info with GOI authorities in Australia. This entry was posted in Dr Yadu Singh, Federation of Indian Associations of NSW and tagged Consulate General of INDIA in Melbourne, Consulate General of INDIA in Perth, Consulate General of India Sydney, Do not use incorrect map of India, Dr Yadu Singh, Federation of Indian Associations of NSW, High Commission of India Canberra, kumud Merani, Manpreet Singh, Michael Ebeid, SBD Hindi, SBS and incorrect map of India, SBS Gujarati, SBS Hindi, SBS Kannada, SBS Malayalam, SBS Tamil, SBS using incorrect map of India. Bookmark the permalink. SBS is Sino Broadcasting Service! During the recent doklam standoff they reported a very Chinese centric news and essentially only showed Chinese news reports and commentators. No one from India was interviewed. Story suggested India has invaded Chinese territory and China is threatening India with war or repeat of 1962 will happen. That’s how they reported. The reporter was also Chinese and newsreader Singaporean Chinese lady!! The article is available online. Can you please send me the link? Thank you.